A PDF document in wide circulation over the last few days purporting to show West Ham’s wage bill is “absolutely a hoax”, the club’s co-owner, David Gold, has told sportingintelligence this evening. The document has become an object of fascination for fans, and a hot topic on message boards, with supporters voicing surprise at how much some players are supposedly paid. In fact, sportingintelligence can reveal the wage bill suggested in the fake document is too low to reflect accurately the club’s actual spending, as an analysis below using real extracts from last year’s club accounts shows. The hoax wage document appears to have been put together by using a mixture of guesswork and press reports (which in themselves are sometimes based on guesswork). Gold’s reference to “the majority” as opposed to “all of” the information simply reflects the fact that some of the guesswork and / or press cuttings turned out to be right; but most of the figures are wrong. The reason that the hoax document – which we publish at the bottom of the page – has been so widely accepted as real is precisely because it seems so plausible. But an examination of West Ham’s real financial data, from the club’s last annual report, gives a better idea of the true picture. The first scanned document below is from page 16 of West Ham’s (real) annual accounts for the financial year 2008-09, or in other words, last season. 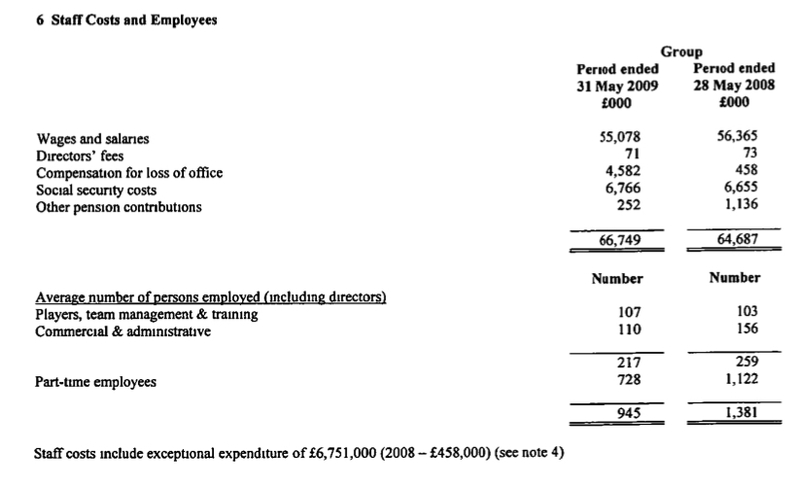 what we’ll call the ‘total employment costs’ (TEC, our term), which are £66.749m, or written as 66,749 in the column headed ‘Period ended 31 May 2009’. the wages and salaries bill, which is the top figure in that same column, or £55.078m. When football finance analysts talk about a club’s wage bill, typically they will be citing the TEC of the club, or £66.749m in this case. When Deloitte & Touche produce their annual football finance review, for example, in most cases the club wage bills cited are the TEC figures, including pensions, social security and other bits and pieces that are part of the overall wage bill. The proportion of the total wage bill that will be spent on players’ wages, including appearance money and bonuses, varies from club to club, but as a broad rule of thumb, it will be somewhere approximating 72 to 73 per cent of the TEC, and a higher percentage of the ‘wages and salaries’ figure. It can be down in the 60s (per cent); it can be pushing 90. It depends on a club’s individual situation, investment, whether they’ve just come up from the Championship and a whole range of other factors. (When sportingintelligence calculates average first-team wages for our sports salaries database, we do so on a club-specific basis using an appropriate multiplier depending on circumstances and guidance). For the purposes of this demonstration only, and verging on the low side, let’s say West Ham’s player budget in 2008-09 was 70 per cent of their total wage bill, or 70 per cent of £66.75m, which equals £46.72m. The vast majority of this would have gone to the first-team squad. Again, specific percentages vary from club to club, as does the size of the squad. Without revealing the actual applicable percentages we used for West Ham last season, we calculated that West Ham’s average first-team pay in 2008-09 was £1.57m per year per player, or £30,263 per week, including bonuses. 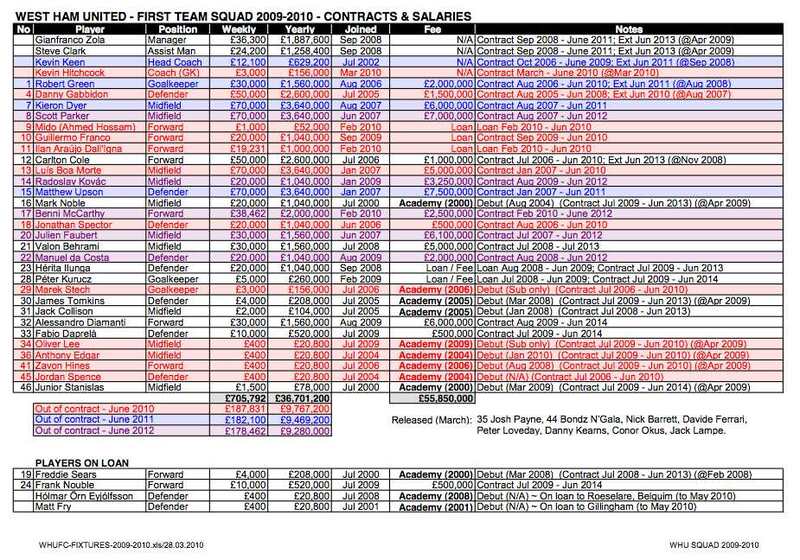 This made West Ham the No9 payers in the Premier League in 2008-09, and they finished 9th in the table. As analysis of a variety of leagues and sports shows in our inaugural review of global sports salaries, there is a strong relationship between pay and success in most sports, and the strongest relationship of all in football, European football in particular. If we take the hoax wage bill as true, the first-team players in 2009-10 are supposedly earning £32.6m between them (£36.7m total minus coaching staff and fringe players), or almost £14m less than last year collectively, a drop of 30 per cent. That is some fall, even in a club making economies, especially as they have kept hiring as well as losing players over the year, and especially as they had already undergone major cost-cutting for 2008-09. As the accounts for last season said: “The board embarked on a major initiative to generate essential cash flow by a programme of player sales and associated wage savings.” In other words, the 2008-09 TEC of £66.75m was already trimmed down, West Ham having sold players including Zamora, Ferdinand and McCartney, and having freed themselves of the wage drain that was Freddie Ljungberg. West Ham may well have made further cuts since, but they won’t be a further 30 per cent in a year. What is feasible is that if you take something akin to the total hoax bill, then add guesstimated figures for appearance money and bonuses (which the hoax bill excludes), then you might indeed get somewhere approximating West Ham’s real bill. And that’s why the hoax is so believable. But just wrong. And too low.